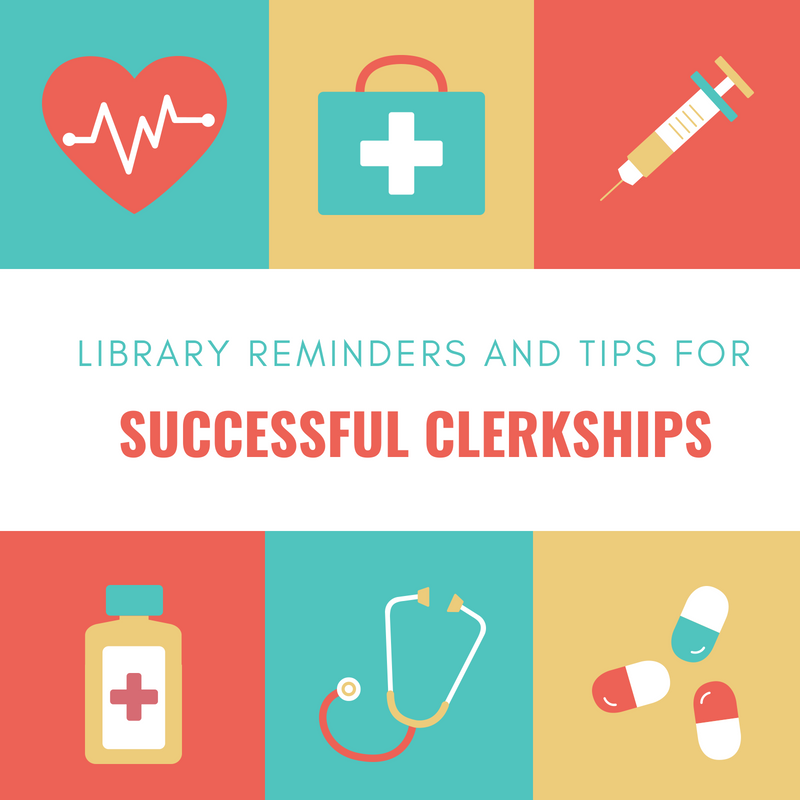 Below are a few reminders and tips that will help you during your clerkships. Clerkship Resource Guide - This guide is focused on information resources to help third-year medical students during their clinical clerkships. NEOMED and OhioLINK books can be delivered to our affiliated hospital libraries for you to pick up. If you have questions about this process, please email us. AccessMedicine – New Features: Clinical Prep – provides access to highly credible, to-the-point information on common clinical questions that arise in clinical clerkships and similar patient care experiences. Hospital Corner – procedure videos, board review books, cases. UpToDate: This account is linked to your affiliation with NEOMED. To keep your account active, you must change your password every 90 days. In-application & email messaging will inform you of the need to verify affiliation if you have not done so by day 80. You will receive a second alert at day 90. If you fail to re-verify by day 90, you will lose mobile and remote access. To regain access, please complete the re-verification process. You can do this by connecting to UptoDate while on campus and using a computer onsite. ILLiad – Register for an account if haven’t already. Order any article or book you may need while on your clerkships. EBM Resources Site in AIMS – You have access to this site which includes a lot of information from your EBM course that will help with PBLI presentations. All of their services and forms can be accessed online, but you must be able to login to myKidsnet (you can do this in the Library.) Paper requests for literature searches are available in the library. Requests for articles may be emailed to them. Located on the third floor of the hospital’s Akron campus, near the cafeteria. They are usually staffed from 7:30am-5pm, with after-hours access by badge. They offer a variety of services -please stop by for a brochure or a quick tour. Ellen, Judy, and Alyssa look forward to working with you! Call 330-543-8250 or email library@akronchildrens.org with any questions. Located on the second floor of the main hospital near the lobby and main entrance. The Medical Library is staffed Monday through Friday, 8:00 AM - 4:30 PM. Badge swipe access at other times. Library Services Coordinator, Clare Leibfarth and Library Operations Assistant, Denise Mullins will be happy to assist you in finding the information that you need to support education and patient care. As always, the library staff at NEOMED are here to help! Don’t hesitate to email the library or call with an article, searching or library-related questions.